The first of the three Year’s Best anthologies to be published (Feb 2005), and the baby of the bunch both in terms of being the smallest volume and in only being in its fourth year. 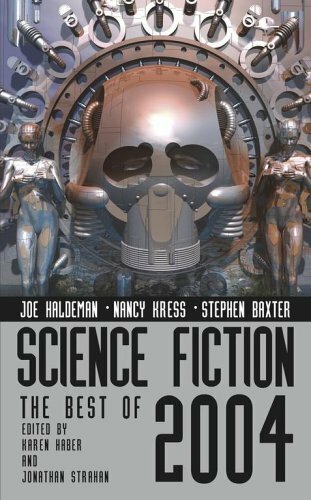 Although the first to be published, I have previously read and reviewed Hartwell/Cramer’s Year’s Best SF 10. Both of the volumes are dwarfed both in size and longevity by the Dozois series, of which #22 is awaiting my attention. James Patrick Kelly. The Best Christmas Ever. Originally in : SCI FICTION. Last Man Alive story, with a Christmas setting, a combo which could slip into cheesy sentimentality, but Kelly handles the story well, with the elderly guy surrounded by robots willing to do a lot to please him, and being able to offer him a special gift that makes an otherwise moribund existence worthwhile. An excellent, inventive story, some of the nuances of American state-level politics which may have slipped past me (knowledge thereof mostly gleaned from college gridiron). With intelligence imbued in all manner of things (most notably the protagonist’s car), a dark nearish-future in which the population are in thrall to an (almost)all-powerful political force. If you only follow one of the links from this review, follow this one. Nominated for both Hugo and Nebula’s and rightly so. With Wolfe, at his best (which is most of the time) you know you are in for a story which is going exercise the grey matter more than the norm. This is not different, as he takes a somewhat hackneyed trope and gives it a run for its money. We are given the journal of a time traveller, someone sent back in time to affect the course of history. However, the time traveller is somewhat disorientated, and we struggle with him to make sense of where he is and what he is meant to be doing. We realise that he is in a period which we identify as greek myth, setting sail with Jason and Hercules on the trail of the golden fleece (the closer your read the story the more obvious this becomes). The traveller encounters a wide range of creatures, including multi-armed giants, whilst his real mission (travelling from Europe to the New World) gradually becomes clear. Wolfe manages to breathe a lot of life into the story, in spite of the journal entry format, in an intriguing little piece. A shorter piece, in which we have illustrated a means by which longevity is enabled through an exorcism-like process. The story rather left me feeling that I had been missing something, and indeed, a quick google shows that the story appeared in Amazing alongside a (well known?) painting, to which the story was intended to relate. Without the painting from which the story gets it entire purpose, the story rather lacks sufficient to be a Year’s Best. Good to see Baxter represented, as his writing career takes on Arthur C Clarke’s mantle with aplomb. Jeff Vandermeer. Three Days in a Border Town. Set in the author’s ‘Veniss Underground’ world, an unsettling story which begins with someone walking from the desert into a town, whose ghost-like appearance slowly takes on a more solid substance. The yearning search for a moving, invisible city is part of a search for a lost love, and as the search carries on we find out more about that lost love. Vandermeer provides a strong sense of place and character. Haber/Strahan state in their into to the story that no knowledge of the series is necessary for enjoyment of this story, but I’m not altogether convinced, as the story brings together and concludes a series of stories about to be fixed-up in the forthcoming novel Accelerando, which is due out very shortly, and Stross celebrating his 2005 Hugo, a good choice for the volume. A young couple, both players in a society where people gamble on events and seek the advice of a network multitude, go against the advice of the world at large, and wed. They find quickly that they were wrong not to take on board that advice. Should they listen to what others say as to the likely future of their daughter? To be represenative of any year in short SF requires a Reed story, and there are lots from which to pick. I’m not sure that this would have been mine though. Nancy Kress. My Mother Dancing. A short piece in which far-future post-humans have been seeding the otherwise barren galaxy. The non-gender-specific crew are thrown into confusion when the well-established answer to Fermi’s Paradox (there isn’t anything/anybody out there) is challenged by data from a colony on whose progress they are checking. (Bacigalupi) postulates a not-too-distant future in which the Earth is a seething, war-reduced, inhospitable environment – or rather, an environment which would be inhospitable to us as we are now. In his future humanity has embraced nano-tech and genmod to the extent that even the sand and slag of the title can sustain us. My memory of reading the story was that it was fine, but not one to stand out. A story notable for its appearing on Amazon as a teaser for a novel. And the story reads as such, a short vignette, with an interesting trio of characters (bar owner, fat alien barfly, man who provides a service taking tourists into a mostly unexplained strange part of the city). A nominee for the James Tiptree Jr Award (for addressing gender issues), which suggests a paucity of good short SF in that milieu this year, as this story does’t really push the boundaries in addressing such issues. The protagonist is a female bird, exact genus not divulged. Eagle or vulture perhaps, although the basis of the story is that the species has grown so large as to be unable to fly (chicken, Ostrich?). However, as the species can splint broken legs, then presumably we are not to look too closely at that issue. The bird in hand is finally worn down by a younger bird to go flying, and sets out on a major trek to higher ground to attempt to rediscover this lost art. However, they are followed by a large male of the species, who has his eye on the little one for something to eat, and has other plans for her. The presence of the male leads the female to a scrabbling attempt at flight, down a slope, and she ends up there with the baby and the injured male, encouraged to take steps to change the dead-end path of the species. The third in what is evidently a connected series of shorts on SCI FICTION, so maybe the story loses a little on being taken out of its setting. Walter Jon Williams. The Tang Dynasty Underwater Pyramid. Williams adds substantially to the milieu of stories involving Andean secret agents doubling as street musicians who are operating in tandem with a water ballet company operating on a passenger ship disguised as a Tang Dynasty Palace, who find that the salvage that they are after is threatening to pollute the sea. Heck, he virtually rewrites the whole milieu. The sfnal bits come at the conclusion of a wryly humorous story, which is fine without, to my mind, being a Year’s Best. One of the beefs with previous volumes has been addressed, as this year we have introductions to the stories, which improves the reading experience immeasurably. Next thing for ibooks to address is to have the author/title of each story appearing on each page, rather than simply giving the title of the book on each page. Also necessary is sorting out of typos – I’m not altogether clear as to how typos get in when the originals are in electronic format – one example : in Williams’ story, the sentence starting ‘Out of deference to me’ which is correct on the SCI FICTION website, becomes ‘Our of deference to me’. Just how does that happen when presumably an electronic original is given to the publisher to layout? 9 of the 13 stories in the volume in hand appeared in the four major SF sources (Asimovs, Analog, F&SF, SCI FICTION), which doesn’t leave a whole lot of room for surprises. Fortunately, as I had been somewhat remiss in my reading of SCI FICTION’s output, there was more new content for me than might have been the case. None of this volume’s 4 stories from Asimovs/Analog/F&SF duplicate the 12 from those sources in Hartwell/Cramer’s ‘Years Best SF 10’ collection. Similarly none of the 4 from SCI FICTION duplicated the 2 from that source in Hartwell/Cramer. And the three anthologies sampled for this collection were different from the six anthologies Hartwell/Cramer drew upon, leaving no overlap at all in the stories selected by these competing volumes. So you could glue the two volumes together and make a more Dozois-sized anthology. My feeling with this volume, as in previous years, is that the selections seem somewhat arbitrary, as if the rush to get the volume out so early (the initial publication date of February).